Thought Balloons - Creating Comics One Page At A Time: Why Ms. Marvel? Because everyone should get to be a superhero. In February of this year, Marvel Comics gave us the newest character to go by the name Ms. Marvel. 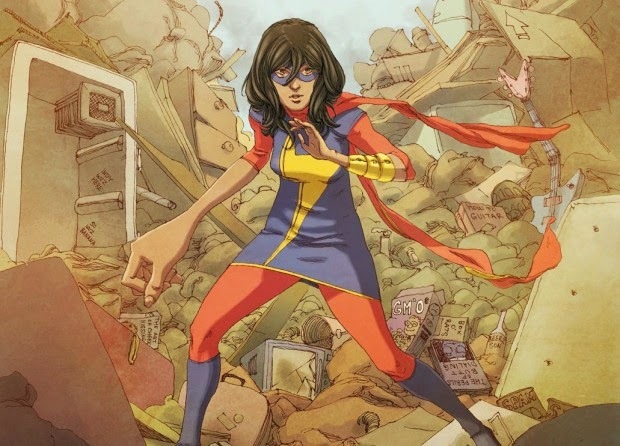 Kamala Khan, a teenage Pakistani American from New Jersey, who, after exposure to the Inhumans' Terrigen Mists, finds herself with the ability to change her shape. A superhero fangirl, whose personal idol is Carol "Captain Marvel" Danvers, Kamala finds herself inspired to use her newfound powers to help people. Created by editor Sana Amanat, writer G. Willow Wilson, and artist Adrian Alphona, Kamala represents the first Muslim character to ever headline a Marvel Comic book. And to me, she represents something else - the idea that EVERYONE can potentially be a superhero. Kamala is a teenage Muslim girl, and her story provides a window into that world of experience, but she is not defined by any one attribute or label. She is brave, charming, likeable, and utterly relatable, and my favorite new character to be introduced at the House of Ideas since Miles Morales. Every issue of Ms. Marvel has made me smile, has made me laugh, has made me cheer, and has made me learn something. Everyone deserves to be a superhero. Kamala Khan is proof of that. Cosplay by Riana Elliott. Photo By Pat Loika. 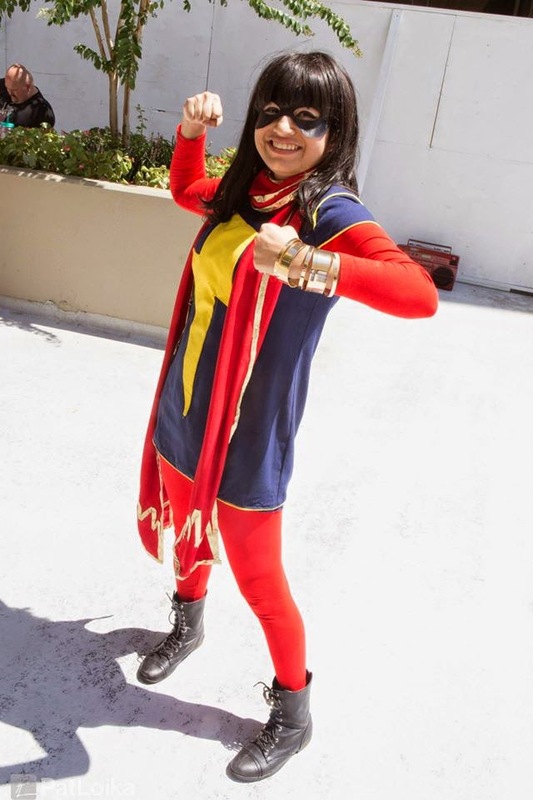 Labels: Ms. Marvel (Kamala Khan), Why? I'd rather not reveal my actual name, though. Also, I screwed up on the first post and so I'm trying again. Interviewer (pink letterbox): Chief LaFours, in the wake of the recent rise in supervillain activity within Jersey City, what are your thoughts regarding the masked superhero Ms. Marvel and her role in protecting the public? Chief (blue letterbox): I want to make something very clear. This is not New York. We don't have to deal with a thousand superheroes and supervillains flying everywhere. In this city, we make do with what we have, and everything is better for it. Once you start dragging superpowers into the situation, you get a warzone, and I am not letting this city fall to New York's level. Chief (blue letterbox): I ask that anybody who sees a superpowered individual causing trouble to call the local authorities immediately. Do NOT attempt to detain them yourself. We can handle them, you can't. Chief (blue letterbox): As to this... Ms. Marvel, I will not hesitate to detain her if she becomes too much of a public nuisance. Allowing vigilantes like her to interfere in police business indicates a complete lack of respect for our work. Chief (blue letterbox): And I don't need to remind people of the incident in which the assassin Arcade captured all those children and made them fight each other to the death. The leaked video footage is evidence enough that psychos like him are not the kind of people any child should be allowed to deal with. Chief (blue letterbox): We're not in the 1960s. The world we live in now has no place for child superheroes anymore. Do you hear me, Ms. Marvel? Go home for your own safety and let us do our job! Interviewer (pink letterbox): Interesting. Would anybody like to comment on what they think about Ms. Marvel? Audience member (yellow letterbox w/ lightning bolt in front): I do... I think she's magnificent! First of all: Welcome to Thought Balloons! It's always good to see a new play-at-home contributor! Second: Second - there is a LOT of dialogue here. A LOT. I'm not always the best when it comes to judging how well a certain amount of text will fit into a certain space, but I'm inclined to think it would be a tricky situation to fit all the words you'd like around the action you've also written up. Also, some of the text - provided all if it could remain in-tact - it probably wouldn't hurt to break some of the longer segments up across multiple boxes. It was a first attempt and I know it's too wordy in hindsight. Given the option, I would redo it. Thanks for joining in and playing along at home. I'm double-excited that you chose to do so on my selection week. I dig your concept. You clearly have a great grasp on current continuity, and you're working that well into the story. You're also allowing your letterer a chance to REALLY contribute to the page, with the different color and different designed caption boxes. I think a lot of times we forget that these are tools we can use to tell the tale. Now, these are guidelines, not anything chiseled into stone, but I find them very helpful. As for the option to redo - You've got it! Edit that puppy up and then resubmit it below! Editing is your friend. The script I just completed for my new comic went through, no joke, 17 revisions before I locked it down. Again, welcome, and thanks for playing! My colleagues seem to have brought up most of the salient points at this juncture, but I would like to take a moment to laud your scene choices. They could be tied to the dialogue a little more directly, but on their own they are a whole lot of fun. Some great thought and care went into their devising. Alright, one more try. I tried to cut the dialogue down more. I've got other ideas that I might try later, too. Interviewer (pink letterbox): Chief LaFours, what are your thoughts regarding the masked superhero Ms. Marvel and her role in protecting the public? Chief (blue letterbox): I feel that once you start dragging superpowers into a situation, you get a warzone, and I am not letting this city fall to New York's level. Chief (blue letterbox): I ask that anybody who sees a superpowered individual causing trouble to call the local authorities immediately. Do NOT attempt to detain them yourself. Chief (blue letterbox): As to Ms. Marvel, I will detain her if she becomes too much of a public nuisance. Allowing vigilantes like her to operate in this city indicates a complete lack of respect for our work. Chief (blue letterbox): And I don't need to remind people of the much-publicized incident with that assassin Arcade. Psychos like him are not what any child should be allowed to deal with. EDIT: Deleted first attempt due to missed errors. I decided to try another one. This time, I tried to play with perspectives in each panel. Ms. Marvel - What's In A Name? Carol: Who gave you permission to take my old codename? Because I sure as hell didn't! Carol: My memory's been scrambled non-stop over the years, but I still remember very well that I don't take kindly to unauthorized imitators. Especially shapeshifters. What right do YOU have to take that name? I just wanted to do good... Like you. Carol:If that's so... then you might just be worthy of the name Ms. Marvel yet. If I had to choose between your two submissions, I'd go with the second. Not only is the dialogue crisper, the panels tighter, but you're nailing CHARACTER. You hone right in on why Kamala is a great person to write about, and read about. Keep coming around, Match!